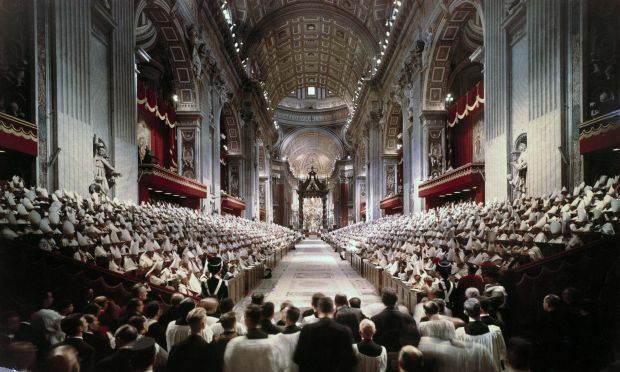 VATICAN CITY (CNS) — Blessed John XXIII called the Second Vatican Council in the conviction that it was necessary for the Catholic Church, yet without pre-conceived ideas of what it would accomplish, said Vatican II participants who recalled the event half a century later. Blessed John had come to a “conviction that something ought to be done in order to make the church more responsive to this modern world, in order to make the modern world more responsive to the church. And that intuition went far beyond his intellectual preparation,” said Jesuit Father Ladislas Orsy, a “peritus” — or expert theological adviser — at the council. Cardinal Loris Capovilla, who served as Blessed John’s private secretary during his pontificate, was privy to some of the pope’s first remarks, made only a few days after his election in 1958, about what would become Vatican II. Cardinals and bishops had presented the new pontiff with a litany of challenges before the church — “not doctrinal but pastoral problems,” Cardinal Capovilla said — in areas that included liturgy, diplomacy, and the education and discipline of priests. When the secretary refused to comment, the pope interpreted his silence as disapproval. Blessed John died June 3, 1963, after the council’s first session, and the remaining four sessions took place under his successor, Pope Paul VI. Yet Blessed John’s ideas greatly influenced the outcome of Vatican II in certain areas, including liturgy. In that spirit, Cardinal Poupard said, the liturgical reform that followed in the council’s wake produced a missal that was simpler, clearer and celebrated in modern languages. The pope’s influence was also eventually seen in the council’s 1965 declaration “Nostra Aetate,” which exonerated the Jewish people of collective guilt for the killing of Jesus and affirmed that God’s covenant with them had never been abrogated. Cardinal Georges Cottier, a Vatican II peritus, said Blessed John appreciated the special need for the document in the aftermath of the Holocaust. His sensitivity to the matter reflected his experience as a Vatican diplomat in pre-war Bulgaria, where he had befriended many Jews, and his later actions to save Jews in the region from the Nazi genocide. “So he knew the drama” of the Jews, Cardinal Cottier said. “Right away he said yes, with enthusiasm,” to a proposal for such a document. Though Blessed John did not have a set program for the council, he did have models for it, including some contemporary secular initiatives.